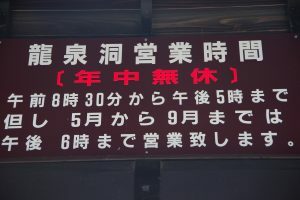 Shut sinus time of Ryusendo Cave is 6:00 p.m. from Wednesday, May 1. It becomes later for one hour than the present. In the sightseeing time required, Ryusen-do Cave merges the new sinus Hall of Science for approximately 15 minutes from ten minutes in approximately 40 minutes from 30 minutes and is one hour.